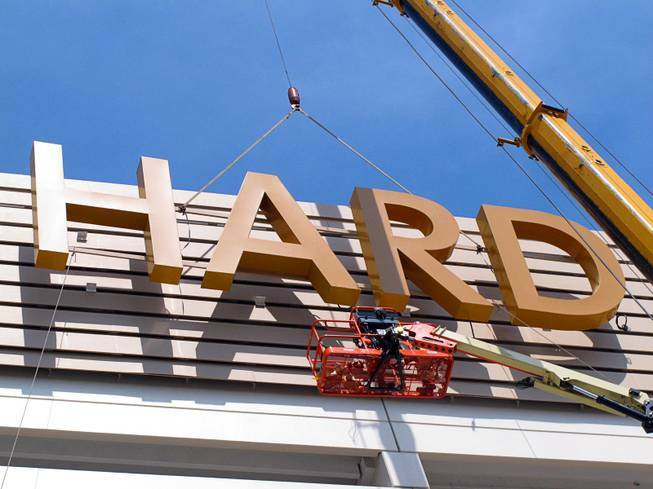 This Friday, May 4, 2018 photo shows part of the first sign for the soon-to-open Hard Rock Casino in Atlantic City N.J., being lifted into place on the building. As Atlantic City’s casinos mark their 40th anniversary, the industry is hailing the reopening of two of the five casinos that shut down since 2014, though some worry that re-expanding the market could lead to the same conditions that caused the closings in the first place. Hard Rock, which is the former Trump Taj Majal, and Ocean Resort, which is the former Revel, are both due to open on June 28. Published Friday, May 11, 2018 | 12:15 a.m. Updated Friday, May 11, 2018 | 8:35 a.m.